Penn Yan Aero was established in 1945 by Harold Middlebrook. Since then, the company has been continuously owned and managed by the Middlebrook Family. The Middlebrooks are active aircraft owners, pilots, and mechanics. They have focused their attention and resources on Lycoming and Continental aircraft engines; no removals or installations, just engines. The Middlebrooks have attracted talented, like-minded professionals who have joined Penn Yan Aero and have helped hone its practices and capabilities to unmatched levels. The experienced, long-term workforce is empowered with the best tools and technology, allowing them to focus on delivering the best engines in the world. The result is smooth-running, long-lasting Penn Yan Aero overhauled Lycoming and Continental aircraft engines, backed by unparalleled service and the best warranty in the business. 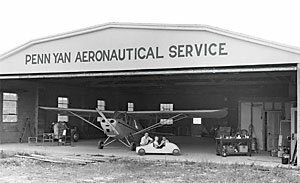 Penn Yan Aero is located at the airport near the Village of Penn Yan, New York (PEO) (N42-38.23; W077-03.17), a small, rural community in the beautiful Finger Lakes region of Western New York. Penn Yan, New York 14527 U. S. A.
Penn Yan Aero is an Authorized Lycoming and Continental Distributor. Penn Yan Aero is Part 145 FAA Approved Repair Station Number Y2GR396Y.